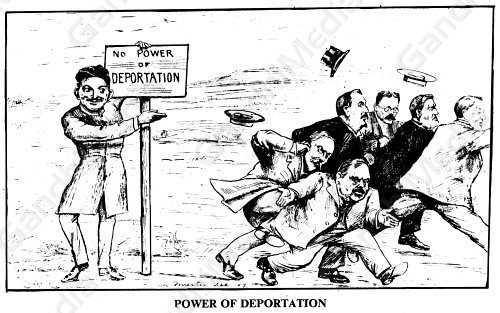 Power of Deportation - The Government: “Whew! Never thought of meeting This! Hard loop!” (Left running). – 1907. The Transvaal Government had decreed that any Indian who did not register under the Act was liable to be deported from the State. General Smuts declared: "The Government have made up their mind to make this a white man's country, and however difficult the task before us in this direction, we have put our foot down and would keep it there." In the ensuing satyagraha movement Gandhi insisted as a condition for a settlement that the Government's powers to deport unregistered Indians be scrapped. This demand caused much embarrassment to the Government, with its policy of white supremacy.